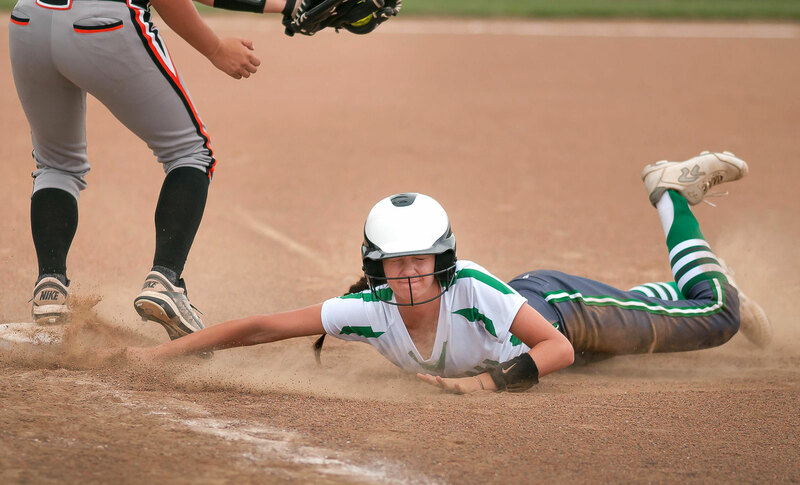 A Stonewall Lady Longhorn base runner dives back into first base at yesterday’s Tupelo Invitational Tournament. This image was made with my AF Nikkor 180mm f/2.8. Trade-offs: I made this image with the 70-300mm f/4-5.6, zoomed to about 120mm. It’s solid action, but as you can see, this lens doesn’t have the magic selective focus that an f/2.8 lens offers. 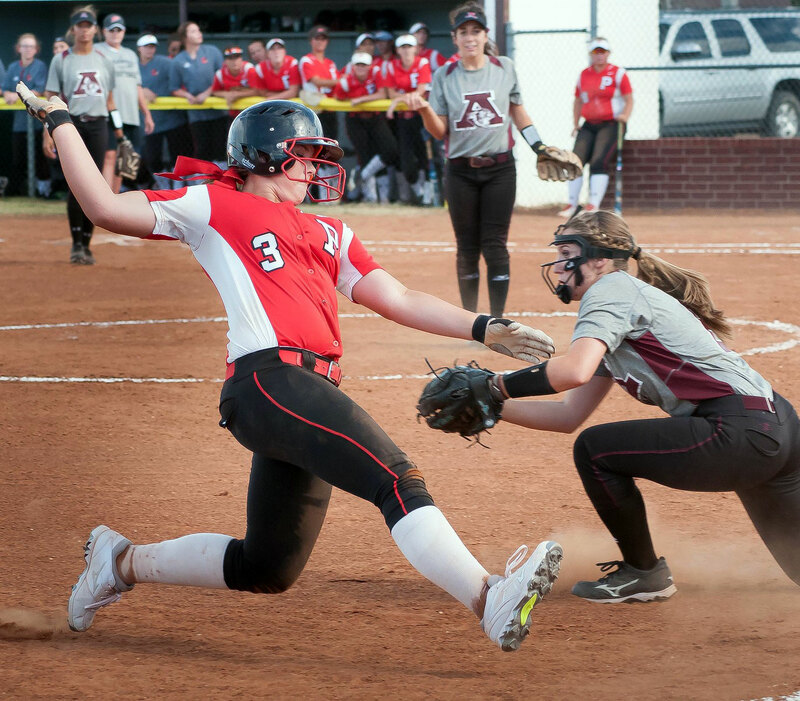 Regular readers will recall that much of July is a very slow period for me, followed by a nothing short of frantic period in August when my newspaper and I cover all manner of news and sports at area high schools and the college. Among other challenges, I ask myself at every turn about which lenses will work in which circumstance. Although I am in possession of industry-standard lenses, I ask myself this for a very important reason: my body. I am not 26 any more – in fact, I am twice that age, and though I am in great health, it is now a very legitimate consideration to try to carry lighter gear when I can. It’s hard for young photographer to appreciate this idea, since their bones and joints recover faster and hurt less than someone my age when we carry 15 pounds of hardware vs when we carry 1.5 pounds. 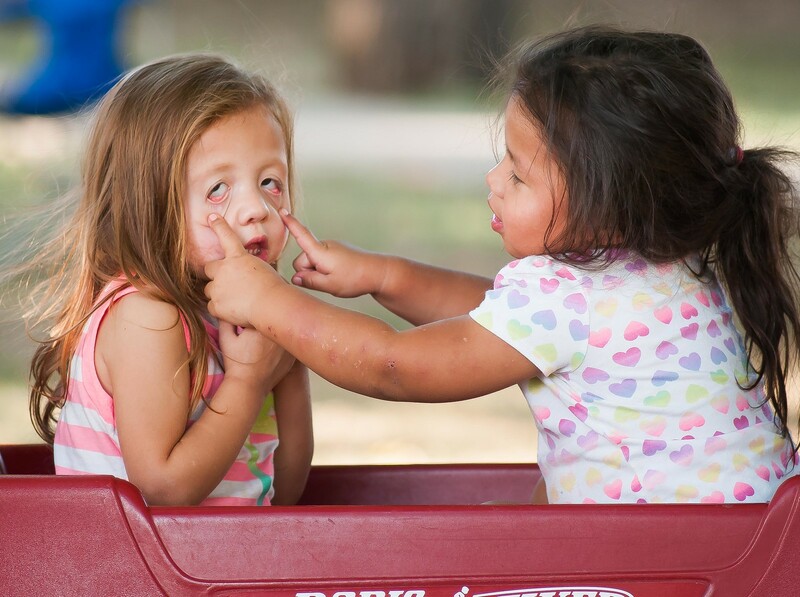 Paityn Corcoran and Colby Anderson take turns making faces with each other at National Night Out at Crabtree Plaza on the ECU campus Tuesday night, Aug. 2, 2016. I made this image with my AF Nikkor 180mm f/2.8 of 1987 vintage, which I bought for just $74 from an eBay seller in 2011, who warned me that “something is definitely up with this lens.” In the five years since then, I have made thousands of great images with it. But Richard, what about image quality? Don’t you want the very best? That’s the rub, really: knowing when a lighter, smaller lens can deliver a top-quality image, and when it can’t. 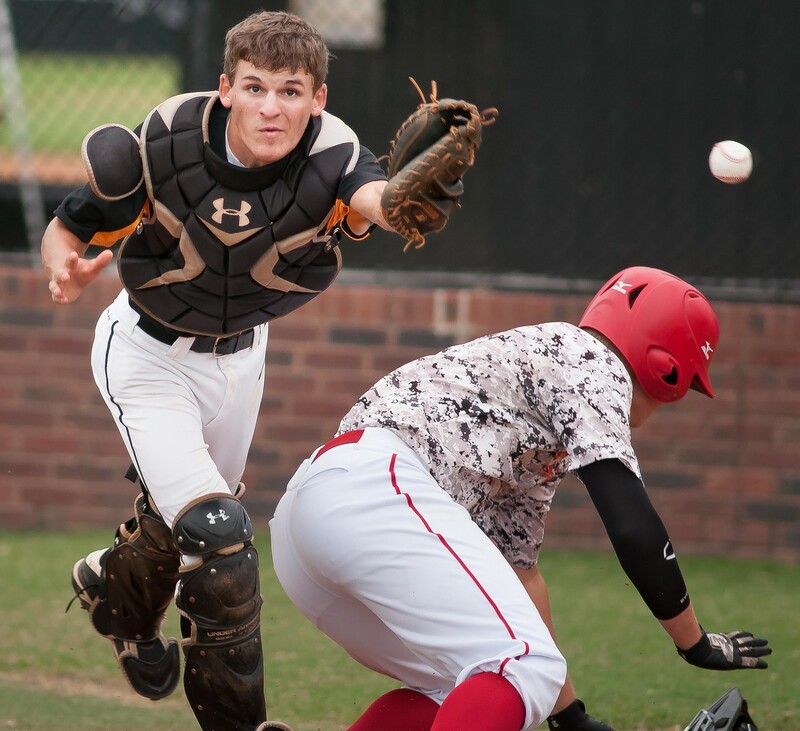 I shot this last night at the Tupelo Invitational baseball tournament, with my 300mm f/4, from the third base dugout. Since it is not a zoom lens, it forces you to be in the right place when the action happens. The AF-S Nikkor 80-200mm f/2.8. This lens is big and heavy, versatile, focuses instantly and accurately, and is sharp at f/2.8 at all focal lengths. It is indispensable in low-light situations where I am at the margins of every element, like high school football at night. The AF Nikkor 180mm f/2.8. This lens is the dark horse winner for its lighter weight, sharpness wide open, and superb selective focus. Its main drawback is lack of versatility: no zoom means I need to be in the right place or get there in a hurry. The AF Nikkor 70-300mm f/4-5.6. This lens is even lighter than the 180mm, and the bigger zoom range than the 80-200mm makes it an apparent winner for sports action. But the fact that so much is crammed into such a small package, and the fact that it’s so inexpensive, means that everything is a compromise. This lens isn’t very sharp at the longer focal lengths unless it is stopped down to f/6.3, meaning that it is really only useful in bright daylight. It also doesn’t create particularly appealing selective focus. The AF Nikkor 300mm f/4. I love this lens for the long reach it gives me for far-away sports like baseball, tennis and soccer, but my back and neck hate it because it is heavier than other options, and it is front-heavy. For some, a monopod might seem to be in order, but I find that monopods are too restrictive of camera movement, and add to the weight of the entire package, which is noticeable when moving, which is all the time. So what’s the answer? Smart selection. Bright daylight softball? The 70-300mm. 6 pm-start football? The 300mm. Friday night lights? The 80-200mm. Feature photos when I need f/2.8 but not the weight? The 180mm. 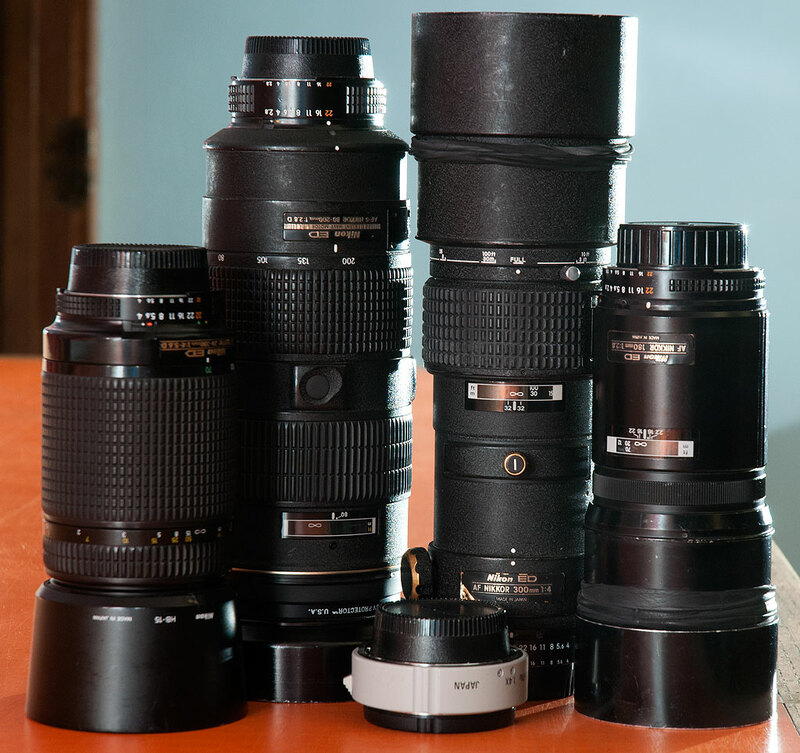 All in the family: my fall sports lens selection. From left to right are my 70-300mm f/4-5.6, my 80-200mm f/2.8, my 300mm f/4, and my 180mm f/2.8. At the botton of the frame is a Tamron 1.4x teleconverter, which I sometimes add to my 300mm to make it a 450mm f/5.6. I feel your pain. Well, technically, I’m remembering my own pain, from carrying these heavy beasts, and choosing amongst my stable. I usually brought too much. Thankfully, I rarely face such decisions today.